Cities: Capital: Damascus (1.7 million). Other cities — Metropolitan Damascus (excluding city) (2.7 million), Aleppo (4.6 million), Homs (1.7 million), Hama (1.5 million), Idleb (1.4 million), al-Hasakeh (1.4 million), Dayr al-Zur (1.1 million), Latakia (1 million), Dar'a (1 million), al-Raqqa (900,000), and Tartus (800,000). Nationality: Noun and adjective — Syrian(s). Population (2010 est. )*: 22.5 million. Population growth rate (2009 est. ): 2.37%. Major ethnic groups: Arabs (90%), Kurds (9%), Armenians, Circassians, Turkmans. Languages: Arabic (official), Kurdish, Armenian, Aramaic, Circassian understood within communities, French, English somewhat understood, principally in major cities. Education (2009 est. ): Years compulsory — primary, 6 years. Attendance — 97.9%. Literacy — 86%, illiteracy — 14%. Health (2009 est. ): Infant mortality rate — 17/1,000. Life expectancy — 69.8 years male, 72.68 years female. Work force (5.5 million, 2008 est. ): By occupation — services (including government) 26%, agriculture 19%, industry 14%, commerce 16%, construction 15%, transportation 7%, and finance 3%. Type: Republic, under authoritarian military-dominated Arab Socialist Ba'ath Party regimes since March 1963. Constitution: March 13, 1973. From 1963 until April 2011, Syria was under a legal State of Emergency, which effectively suspended most constitutional protections. Although the State of Emergency was lifted in response to growing opposition, no constitutional protections were implemented and arbitrary detentions and punishments escalated. Branches: Executive: president, two vice presidents, prime minister, Council of Ministers (cabinet). Legislative — unicameral People's Council. Judicial — Supreme Judicial Council, Supreme Constitutional Court, Court of Cassation, Appeals Courts, Economic Security Courts, Supreme State Security Court, Personal Status and local levels courts. Political parties: The National Progressive Front, an umbrella organization for several parties permitted by the government including the Arab Socialist Renaissance (Ba'ath) Party; Socialist Unionist Democratic Party; Syrian Arab Socialist Union or ASU, Syrian Communist Party (two branches); Syrian Social Nationalist Party; Unionist Socialist Party; and other quasi-tolerated parties, generally considered opposition-oriented but enfeebled and reluctant to challenge the government. There are also several illegal Kurdish parties. Recent decrees allowing for registration of parties have had minimal response. Active domestic and external opposition groups have no legal status. Real growth rate (2010)*: 3.0%. Per capita GDP (2010)*: $2,893. Natural resources: petroleum, phosphates, iron, chrome and manganese ores, asphalt, rock salt, marble, gypsum, hydropower. Agriculture: Products: wheat, barley, cotton, lentils, chickpeas, olives, sugar beets, and other fruits and vegetables; beef, mutton, eggs, poultry, and other dairy products. Arable land — 33%. Industry: Types: petroleum, textiles, pharmaceuticals, food processing, beverages, tobacco, phosphate rock mining, cement, oil seed extraction, and car assembly. Trade: Exports (2010 est. ): $12.84 billion: crude oil, minerals, petroleum products, fruits and vegetables, cotton fiber, textiles, clothing, meat and live animals, wheat. Major markets (2007) — Italy 22%, France 11%, Saudi Arabia 10%, Iraq 5%, Egypt 4%, Jordan 4%. Imports (2008 est.) — $17.2 billion f.o.b. : machinery and transport equipment, electric power machinery, food and livestock, metal and metal products, chemicals and chemical products, plastics, yarn, and paper. Major suppliers (2007) — Russia 10%, China 8%, Saudi Arabia 6%, Ukraine 6%, South Korea 5%, Turkey 4%. In 2010 the European Union (EU) was Syria's biggest trading partner, accounting for 22.5% of Syrian trade, followed by Iraq (13.3%), Saudi Arabia (9%) and China (6.9%.) Turkey was in fifth place with 6.6% and Russia was ninth with 3%. Ethnic Syrians are of Semitic stock. Syria's population is 90% Muslim — 74% Sunni, and 16% other Muslim groups, including the Alawi, Shi'a, and Druze — and 10% Christian. There also is a tiny Syrian Jewish community. Arabic is the official, and most widely spoken, language. Arabs, including some 500,000 Palestinian and fewer than 1 million Iraqi refugees, make up 90% of the population. 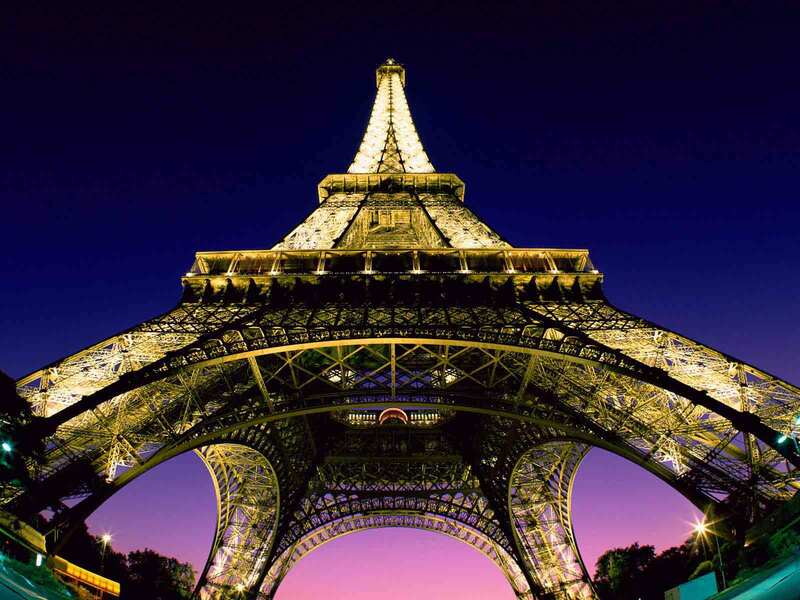 Many educated Syrians also speak English or French, but English is the more widely understood. The Kurds, many of whom speak the Kurdish language, make up 9% of the population and live mostly in the northeast corner of Syria, though sizable Arabic-speaking Kurdish communities live in most major Syrian cities as well. Armenian and Turkic languages are spoken among the small Armenian and Turkman populations. Most people live in the Euphrates River valley, along the coastal plain, and in a fertile strip between the coastal mountains and the desert. Education is free and compulsory from ages 6 to 12. Schooling consists of 6 years of primary education followed by a 3-year preparatory or vocational training period and a 3-year secondary or vocational program. The second 3-year period of secondary schooling is required for university admission. Total enrollment at post-secondary schools is over 150,000. The illiteracy rate of Syrians aged 15 and older is 9.3% for males and 17.8% for females. Archaeologists have demonstrated that Syria was the center of one of the most ancient civilizations on earth. Around the excavated city of Ebla in northern Syria, discovered in 1975, a great Semitic empire spread from the Red Sea north to Turkey and east to Mesopotamia from 2500 to 2400 B.C. The city of Ebla alone during that time had a population estimated at 260,000. Scholars believe the language of Ebla to be the oldest Semitic language. In the east, the ancient site of Mari contains archeological remains of multiple cultures and religions living concurrently in the city. Damascus became a provincial capital of the Mamluk Empire around 1260. It was largely destroyed in 1400 by Tamerlane, the Mongol conqueror, who removed many of its craftsmen to Samarkand. Rebuilt, it continued to serve as a capital until 1516. In 1517, it fell under Ottoman rule. The Ottomans remained for the next 400 years, except for a brief occupation by Ibrahim Pasha of Egypt from 1832 to 1840. Although rapid economic development followed the declaration of independence of April 17, 1946, Syrian politics from independence through the late 1960s were marked by upheaval. A series of military coups beginning in 1949 undermined civilian rule and led to army colonel Adib Shishakli's seizure of power in 1951. After the overthrow of President Shishakli in a 1954 coup, continued political maneuvering supported by competing factions in the military eventually brought Arab nationalist and socialist movements to power. Syria's political instability during the years after the 1954 coup, the apparent parallelism of Syrian and Egyptian policies, and the appeal of Egyptian President Gamal Abdel Nasser's leadership in the wake of the 1956 Suez crisis created support in Syria for union with Egypt. On February 1, 1958, the two countries merged to create the United Arab Republic, and all Syrian political parties ceased overt activities. Cairo directed economic policies in Syria, generating resentment among many Syrians. The union was not a success, and, following a military coup on September 28, 1961, Syria seceded, reestablishing itself as the Syrian Arab Republic. Instability characterized the next 18 months, with various coups culminating on March 8, 1963, in the installation by leftist Syrian Army officers of the National Council of the Revolutionary Command (NCRC), a group of military and civilian officials who assumed control of all executive and legislative authority. The takeover was engineered by members of the Arab Socialist Resurrection Party (Ba'ath Party), which had been active in Syria and other Arab countries since the late 1940s. The new cabinet was dominated by Ba'ath members. The Ba'ath takeover in Syria followed a Ba'ath coup in Iraq the previous month. The new Syrian Government explored the possibility of federation with Egypt and Ba'ath-controlled Iraq. An agreement was concluded in Cairo on April 17, 1963, for a referendum on unity to be held in September 1963. However, serious disagreements among the parties soon developed, and the tripartite federation failed to materialize. Thereafter, the Ba'ath regimes in Syria and Iraq began to work for bilateral unity. These plans foundered in November 1963, when the Ba'ath regime in Iraq was overthrown. In May 1964, President Amin Hafiz of the NCRC promulgated a provisional constitution providing for an appointed legislature called the National Council of the Revolution (NCR) composed of representatives of mass organizations — labor, peasant, and professional unions; a presidential council, in which executive power was vested; and a cabinet. On February 23, 1966, a group of army officers carried out a successful, intra-party coup, imprisoned President Hafiz, dissolved the cabinet and the NCR, abrogated the provisional constitution, and designated a regionalist, civilian Ba'ath government. The coup leaders described it as a "rectification" of Ba'ath Party principles. The defeat of the Syrians and Egyptians in the June 1967 war with Israel weakened the radical socialist regime established by the 1966 coup. Conflict developed between a moderate military wing and a more extremist civilian wing of the Ba'ath Party. The 1970 retreat of Syrian forces sent to aid the PLO during the "Black September" hostilities with Jordan reflected this political disagreement within the ruling Ba'ath leadership. On November 13, 1970, Minister of Defense Hafiz al-Asad effected a bloodless military coup, ousting the civilian party leadership and assuming the role of prime minister. Upon assuming power, Hafiz al-Asad moved quickly to create an organizational infrastructure for his government and to consolidate control. The Provisional Regional Command of Asad's Arab Socialist Ba'ath Party nominated a 173-member legislature, the People's Council, in which the Ba'ath Party took 87 seats. The remaining seats were divided among "popular organizations" and other minor parties. In March 1971, the party held its regional congress (covering Syria, rather than the pan-Arab countries) and elected a new 21-member Regional Command headed by Asad. In the same month, a national referendum was held to confirm Asad as President for a 7-year term. In March 1972, to broaden the base of his government, Asad formed the National Progressive Front, a coalition of parties led by the Ba'ath Party, and elections were held to establish local councils in each of Syria's 14 governorates. In March 1973, a new Syrian constitution went into effect, followed shortly thereafter by parliamentary elections for the People's Council, the first such elections since 1962. The authoritarian regime was not without its critics, though it dealt quickly with most. A serious challenge arose in the late 1970s, however, from fundamentalist Sunni Muslims, who rejected the basic values of the secular Ba'ath program and objected to rule by the minority Alawis, whom some considered heretical. From 1976 until its suppression in 1982, the Islamist Syrian Muslim Brotherhood led an armed insurgency against the regime. In response to an attempted uprising by the Brotherhood in February 1982, the government crushed the fundamentalist opposition centered in the city of Hama, leveling parts of the city with artillery fire and causing many thousands of dead and wounded. From 1982 until March 2011, public manifestations of anti-regime activity were very limited. Syria's 1990 participation in the U.S.-led multinational coalition aligned against Iraq's Saddam Hussein marked a dramatic shift in Syria's policies toward other Arab states and the West. Syria participated in the multilateral Middle East Peace Conference in Madrid in October 1991. During the 1990s, Syria engaged in direct, face-to-face negotiations with Israel, although these negotiations failed. Hafiz al-Asad died on June 10, 2000, after 30 years in power. Immediately following Asad's death, the parliament amended the constitution to reduce the mandatory minimum age of the president from 40 to 34 years old. This allowed his son, Bashar al-Asad, legally to be eligible for nomination by the ruling Ba'ath Party. On July 10, 2000, Bashar al-Asad was elected President by referendum in which he ran unopposed, garnering 97.29% of the vote, according to Syrian Government statistics. He was inaugurated into office on July 17, 2000 for a 7-year term. In the aftermath of the September 11, 2001 terrorist attacks in the United States, the Syrian Government began limited cooperation with U.S. counterterrorism efforts on the basis of shared opposition to al-Qaeda's goals. Syria opposed the Iraq war in March 2003, and bilateral relations with the United States swiftly deteriorated. In December 2003, President George W. Bush signed into law the Syria Accountability and Lebanese Sovereignty Restoration Act of 2003, which provided for the imposition of a series of sanctions against Syria if Syria did not end its support for Palestinian terrorist groups, curtail its military and security interference in Lebanon, cease its pursuit of weapons of mass destruction, and meet its obligations under United Nations Security Council resolutions regarding the stabilization and reconstruction of Iraq. In May 2004, the President determined that Syria had not met these conditions and implemented sanctions that prohibit the export to Syria of U.S. products except for food and medicine, and the taking off from or landing in the United States of Syrian Government-owned aircraft. At the same time, the U.S. Department of the Treasury announced its intention to order U.S. financial institutions to sever correspondent accounts with the Commercial Bank of Syria based on money-laundering concerns, pursuant to Section 311 of the USA PATRIOT Act. Acting under the International Emergency Economic Powers Act (IEEPA), the President also authorized the Secretary of the Treasury, in consultation with the Secretary of State, to freeze assets belonging to certain Syrian individuals and entities. Tensions between Syria and the United States intensified from mid-2004 to early 2009, primarily over issues relating to Iraq and Lebanon. The U.S. Government recalled its ambassador to Syria in February 2005 following the assassination of former Lebanese Prime Minister Rafiq Hariri. Prior to the assassination, France and the United States in 2004 had co-authored UN Security Council Resolution (UNSCR) 1559 calling for "all remaining foreign forces to withdraw from Lebanon." Under pressure from the international community following the Hariri assassination, Syrian units stationed in Lebanon since 1976 were withdrawn by April 2005. Sensing its international isolation, the Syrians strengthened their relations with Iran and radical Palestinians groups based in Damascus, and cracked down on any signs of internal dissent. During the July-August 2006 conflict in Lebanon between Israel and Hizballah, Syria placed its military forces on alert but did not intervene directly on behalf of its Hizballah ally. On May 27, 2007, President al-Asad was reaffirmed by referendum for a second 7-year term, with 97.6% of the vote. During 2008, though Syria's relations with the United States remained strained, Syria's international isolation was slowly being overcome as indirect talks between Israel and Syria, mediated by Turkey, were announced and a Qatar-brokered deal in Lebanon was reached. Shortly thereafter, French president Nicolas Sarkozy invited President Asad to participate in the Euro-Mediterranean summit in Paris, spurring a growing stream of diplomatic visits to Damascus. Since January 2009, President Barack Obama's administration has continued to review Syria policy in light of dynamic changes in Syria and the region, and a succession of congressional and U.S. administration officials visited Syria while in the region. Despite high hopes when President al-Asad first took power in 2000, there was little movement on political reform, with more focus on limited economic liberalizations. The Syrian Government provided some initial cooperation to the UN Independent International Investigation Commission, which investigated the killing of Hariri until superseded by the Special Tribunal for Lebanon. Since the 34-day conflict between Lebanon and Israel in July and August 2006, evidence of Syrian compliance with its obligations under UN Security Council Resolution 1701 not to rearm the Lebanese group Hizballah is unpersuasive. On April 17, 2007, the United Nations Security Council welcomed the Secretary General's intention to evaluate the situation along the entire Syria-Lebanon border and invited the Secretary General to dispatch an independent mission to assess the monitoring of the border and to report back on its findings and recommendations. As of January 2012, the border had yet to be demarcated, and Syrian military attacks on Syrian oppositionists have occurred in areas claimed by both countries. After 2009, the United States attempted to engage with Syria to find areas of mutual interest, reduce regional tensions, and promote Middle East peace. These efforts included congressional and executive meetings with senior Syrian officials, including President Asad, and the return of a U.S. Ambassador to Damascus. The Syrian Government's violent response to public protests since March 2011, however, has isolated Syria politically not only from the United States but also from Europe, the Arab world, and other parts of the international community. The U.S. embassy's role in Syria has strongly supported the movement toward political reform and greater openness. The Syrian constitution vests the Arab Socialist Ba'ath Party with leadership functions in the state and society and provides broad powers to the president. The president, approved by referendum for a 7-year term, is also Secretary General of the Ba'ath Party and leader of the National Progressive Front, which is a coalition of 10 political parties authorized by the regime. The president has the right to appoint ministers, to declare war and states of emergency, to issue laws (which, except in the case of emergency, require ratification by the People's Council), to declare amnesty, to amend the constitution, and to appoint civil servants and military personnel. The Emergency Law, which effectively suspends most constitutional protections for Syrians, was formally in effect through a declared State of Emergency from 1963 until 2011 and remains the de facto standard for security operations. The National Progressive Front also acts as a forum in which economic policies are debated and the country's political orientation is determined. However, because of Ba'ath Party dominance, the National Progressive Front has traditionally exercised little independent power, and most decisions come from the Ba'ath Party Regional Command. The Syrian constitution of 1973 requires that the president be Muslim but does not make Islam the state religion. Islamic jurisprudence, however, is a main source of legislation. The judicial system in Syria is an amalgam of Ottoman, French, and Islamic laws, with three levels of courts: courts of first instance, courts of appeals, and the constitutional court, the highest tribunal. In addition, Muslim and Christian religious courts handle questions of personal and family law for their respective communities. The Ba'ath Party emphasizes socialism and secular Arabism. Although Ba'ath Party doctrine seeks to build pan-Arab identity, ethnic, religious, and regional allegiances remain important in Syria. Syria's religious minorities have valued the actively secular character of the Ba'ath state. Members of President Asad's own minority sect, the Alawis, hold most of the key military and security positions, while Sunnis have held many positions in the powerful Ba'ath Party Regional Command. In recent years there has been a gradual decline in the party's preeminence, with more power held directly by regime-linked individuals and groups. The regime's security services and the military, which consume a disproportionate share of Syria's economic resources, play a large political role. 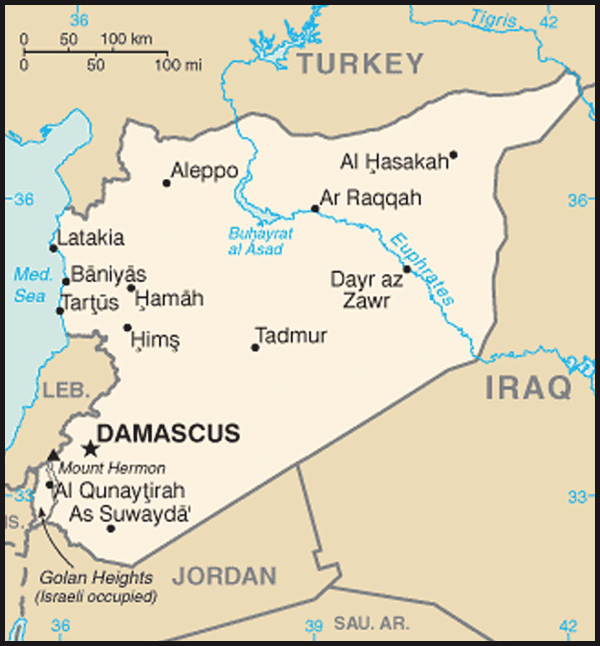 Syria is divided administratively into 14 provinces, one of which is the city of Damascus. A governor for each province is appointed by the president. The governor is assisted by an elected provincial council. Syria maintains an embassy (http://www.syrianembassy.us/) in the United States at 2215 Wyoming Avenue, NW, Washington, DC 20008 (tel. 202-232-6313; fax 202-234-9548). Consular section hours are 9:15 a.m.-3:15 p.m., Monday-Friday. Syria also has three honorary consuls: 1022 Wirt Rd., Suite 300, Houston, TX 77055 (tel. 713-622-8860; fax 713-622-8872); 3 San Joaquin Plaza, #190, Newport Beach, CA 92660 (tel. 949-640-9888; fax 949-640-9292); and P.O. Box 2392, Birmingham, MI 48012-2392 (tel. 248-519-2496; fax 248-519-2399). Officially, Syria is a republic. In reality, however, it is an authoritarian regime under the guise of a democratic system. Although citizens vote for the president and members of parliament, they have little choice and electoral results are often adjusted. Syrians have not had the right to change the role of the Ba'ath Party. The late President Hafiz al-Asad was confirmed by unopposed referenda five times. His son, Bashar al-Asad, also was confirmed by unopposed referenda in July 2000 and May 2007. The President and his senior aides, both those with official roles and those with informal links, ultimately make most basic decisions in political and economic life with a very limited degree of public accountability. The military and security services carry a great deal of power, expressed in even more violent terms since the outbreak of protest demonstrations in March 2011. Political opposition to the President is not tolerated, and allegiance to the person of the President has become the criterion for loyalty to the state. Syria declared an official state of emergency in 1963, which was changed in April 2011 to a de facto authorization of extraordinary measures by the security forces. Syrian governments have justified martial law by the state of war that continues to exist with Israel and by continuing threats posed by terrorist groups. The Asad regime has held power longer than any other Syrian government since independence; its survival is due partly to a strong desire for stability and secularism in a region that has seen many conflicts. The expansion of the government bureaucracy has also created a large class dependent on the regime. The President's strength through early 2011 was partly due to his personal popularity among Syrians who believed he sought to bring change and reform. Following the onset of Syria's protests against the dictatorship, however, his strength is due more to the army leadership's continued loyalty and the effectiveness of Syria's large internal security apparatus. The leadership of both is comprised largely of members of Asad's own Alawi sect. The several main branches of the security services operate independently of each other and outside of the legal system. The primarily Alawi irregulars known as "Shabiha" have demonstrated great violence against protesters and those opposing the regime. Each continues to be responsible for human rights violations of greatly escalating levels. All three branches of government are guided by the views of the Ba'ath Party, whose de jure primacy in state institutions is assured by the constitution. In practice, the decisions of those close to the Asad clan carry most weight. The Ba'ath platform is proclaimed succinctly in the party's slogan: "Unity, freedom, and socialism." The party was traditionally considered both socialist, advocating state ownership of the means of industrial production and the redistribution of agricultural land, and revolutionary, dedicated to carrying a socialist revolution to every part of the Arab world. Founded by Michel 'Aflaq, a Syrian Christian, and Salah al-Din Al-Bitar, a Syrian Sunni, the Ba'ath Party embraces secularism and has attracted supporters of all faiths in many Arab countries, especially Iraq, Jordan, and Lebanon. Over the past 20 years, economic modernization has changed the face of Syrian socialism, and Bashar al-Asad's economic liberalization gave the private sector a dominant role. The regime called for a gradual reform of the Syrian economy, but this was not accompanied by political or security reforms. Nine smaller political parties are permitted to exist and, along with the Ba'ath Party, make up the National Progressive Front (NPF), a grouping of parties that represents the sole framework of legal political party participation for citizens. Created to give the appearance of a multi-party system, the NPF is dominated by the Ba'ath Party and does not change the essentially one-party character of the political system. Non-Ba'ath parties included in the NPF represent small political groupings of a few hundred members each and conform strictly to Ba'ath Party and government policies. There were reports in 2005, in the wake of the June Ba'ath Party Congress, that the government would permit formation of new political parties and legalization of parties previously banned. These changes did not take place, and promises in response to Syria's Arab Spring of greater openness to political participation have not borne fruit. Some 15 small independent parties outside the NPF have operated without government approval, and the new political movements arising from the opposition movement are not considered legitimate by the Syrian regime. The Syrian National Council, Local Coordination Committees, and other opposition groups are considered treasonous by the Syrian Government. The Ba'ath Party dominates the parliament, which is known as the People's Council. Members are elected every 4 years, but the Council has no independent authority. The executive branch retains ultimate control over the legislative process, although parliamentarians may criticize policies and modify draft laws; according to the constitution and its bylaws, a group of 10 parliamentarians can propose legislation. During 2001, two independent members of parliament, Ma'mun al-Humsy and Riad Seif, who had advocated political reforms, were stripped of their parliamentary immunity and tried and convicted of charges of "attempting to illegally change the constitution." Criticism of economic policies became common in 2010 and 2011, but suggestions by the few independents that the security forces be controlled or greater voice be given to unofficial sources were met with threats, and the Council has taken no action to constrain the regime's repression. Although Internet access is increasing and non-political private media are slowly being introduced, the government continues to ban numerous newspaper and news journal publications from circulating in the country, including Saudi-owned Al-Hayat and Al-Sharq Al-Awsat. It has recently allowed sporadic access to previously blocked websites, including YouTube.com, Amazon.com, and Facebook.com but maintains close monitoring of usage in order to identify oppositionists. The nominally-private television station Ad-Dounia carries, in additional to entertainment programming, pro-regime coverage and incitement against U.S. interests. There was a surge of interest in political reform after Bashar al-Asad assumed power in 2000. Human rights activists and other civil society advocates, as well as some parliamentarians, became more outspoken during a period referred to as "Damascus Spring" (July 2000-February 2001). Asad also made a series of appointments of reform-minded advisors to formal and less formal positions, and included a number of similarly-oriented individuals in his cabinet. The continuing arrests and detention of reformists, regime critics, and oppositionists indicate that political reform in Syria is unlikely to be a smooth process. Crackdowns on civil society in 2005, in the wake of Syria's withdrawal from Lebanon, and again in the late winter and spring of 2006 set the stage for the March 2011 mobilization of official and informal security forces to crack down violently on protests and demonstrations and to carry out wholesale arrest campaigns. Although Asad continues to promise steps toward political reform, even as regime forces violently repress alternative political voices, none of his proposed reforms have been implemented as yet and public anger is increasing. The October 2008 arrest of 12 members of the Damascus Declaration National Council, drafters of a civil society reform document written in 2005 and signed by a confederation of opposition parties and individual activists who sought to work with the government to ensure greater civil liberties and democratic political reform, indicated the regime's willingness to suppress advocates for human, legal, or minority rights even in normal times. As street protests swelled after March 2011, international concern and condemnation have grown. The Arab League, of which Syria has been a core member, decried the regime's actions against the Syrian people. The League has successively suspended Syria's membership, called for political and security reforms and negotiations with the opposition, and carried out a monitoring mission to assess the regime's response. As of late January 2012 the Arab League is taking the issue to the United Nations Security Council for action. Syria is a middle-income, developing country with an economy based on agriculture, oil, industry, and tourism. However, Syria's economy began to face serious challenges and impediments to growth even prior to March 2011, including: a large and poorly performing public sector; declining rates of oil production; widening non-oil deficit; widescale corruption; weak financial and capital markets; and high rates of unemployment tied to a high population growth rate. In addition, Syria has been subject to U.S. economic sanctions since 2004 under the Syria Accountability Act, which prohibits or restricts the export and re-export of most U.S. products to Syria. In response to regime brutality against peaceful protesters beginning in 2011, the U.S. Government imposed additional sanctions beginning in April 2011, designating those complicit in human rights abuses or supporting the Asad regime. Sanctions in August 2008 prohibited the export of U.S. services to Syrian and banned U.S. persons from involvement in the Syrian petroleum sector, including a prohibition on importing Syrian petroleum products. The European Union, Japan, Canada, and other countries have also implemented a range of bilateral sanctions on the Syrian government. As a result of an inefficient and corrupt centrally planned economy, Syria has both low rates of investment and low levels of industrial and agricultural productivity. Consumer unwillingness to spend money in turbulent times, a devastated tourism sector, customs spats with Turkey, pressure on the Syrian pound, and increasing unemployment and factory closings led the IMF to reduce estimates of economic growth in 2011 and to project negative real GDP growth in 2012. The two main pillars of the Syrian economy have been agriculture and oil. Severe drought badly affected the agricultural sector, reducing its share in the economy to about 17% of GDP, down from 20.4% in 2007 and 25% in the 1990s. On the other hand, higher crude oil prices countered declining oil production and led to higher budgetary and export receipts before international sanctions on Syrian oil cut revenue to the Syrian Government by $2 billion, according to the Syrian Minister of Petroleum in January 2012. Water and energy availability are among the most pervasive issues facing the agriculture sector. The agricultural sector has also suffered from the government's vacillation on subsidies for key inputs such as fertilizers, fuel, electricity, and water. Drought has continued for several years and thousands of small farmers and herders have been displaced to the outskirts of cities to the west, including Damascus. Wheat and barley production is heavily dependent on rainfall, and in dry years irrigation places high demands on water pumps run on electricity or diesel. The UN has implemented an emergency program, but food distribution has been stopped by security conditions. Syria has moved from being a net exporter of wheat to a net importer, and subsidies for bread and sugar have placed an additional strain on the budget as world prices have risen. Damascus implemented modest economic reforms between 2001 and 2010, especially under the guidance of Deputy Prime Minister for Economic Affairs Abdullah Dardari, including cutting lending interest rates; opening private banks; consolidating all of the multiple exchange rates; raising prices on some subsidized items, most notably diesel, other oil derivatives, and fertilizers; and establishing the Damascus Stock Exchange, which began operations in 2009. Damascus has alternately raised and lowered the price of subsidized diesel in response to political conditions, and as of January 2012 the government announced a policy to reduce subsidies and allow prices to rise. In addition, President Asad signed legislative decrees to encourage corporate ownership reform and allowed the Central Bank to issue Treasury bills and bonds for government debt, although no debt instruments were available until December 2010. Despite these reforms, the economy remains highly controlled by the government, and rapid fluctuations in the regulatory environment impede healthy growth. Long-run economic constraints include increasing pressure on water supplies caused by heavy subsidized use in agriculture, increasing demand for electricity, rapid population growth, declining oil production due to limits on exports, high unemployment, exchange rate uncertainty, and rising budget deficits. The government hoped to attract new investment in the tourism, natural gas, and service sectors to diversify its economy and reduce its dependence on oil and agriculture. Reform was slow and ad hoc as factions in the government struggled to agree on economic theory. The social market economy proposed by the regime generated argument over the balance between private sector growth and social protection. For ideological reasons, privatization of government enterprises is still not widespread, but it is in its initial stage for port operations, power generation, and air transport. Most sectors are now open for private investment, but neither domestic nor foreign investors are willing to commit funds in Syria at this time. The Bashar al-Asad government started its reform efforts by changing the regulatory environment in the financial sector. Private sector banks were legalized in 2001, and after the initial openings in 2004 more than a dozen conventional and Islamic financial entities have established a presence in Syria and on the Damascus Stock Exchange. Syria has taken gradual but wavering steps to loosen controls over foreign exchange. In 2003, the government decriminalized private sector use of foreign currencies, and in 2005 it allowed licensed private banks to sell foreign currency to Syrian citizens under certain circumstances and to the private sector to finance imports. In October 2009, Syrians traveling abroad were permitted to withdraw the equivalent of up to $10,000 from their Syrian pound accounts. Following the outbreak of protests in March 2011, regulations on bank and personal access to foreign currencies have swung widely between initial decrees permitting any Syrian to withdraw $5,000 monthly for any use and other decrees prohibiting the use of U.S. dollars entirely. In late January 2012, the regime decided to make foreign currencies available again at a floating rate, in an effort to stem the rapidly falling Syrian pound exchange rate against the U.S. dollar and the Euro. To attract investment and to ease access to credit, the government allowed investors in 2007 to receive loans and other credit instruments from foreign banks, and to repay the loans and any accrued interest through local banks using project proceeds. In February 2008, the government permitted investors to receive loans in foreign currencies from local private banks to finance capital investment. The government passed a law in 2006 which permits the operation of private money exchange companies, which have been subject to an unpredictable regulatory context. A small black market for foreign currency is active but practitioners have been subject to arrest. Syrian policies from the 1960s through the late 1980s included nationalization of companies and some private assets. Despite steps toward economic modernization beginning in the late 1990s, Syria failed to join an increasingly interconnected global economy. Economic conservatives who resisted modernization pointed to Syria's financial independence as its salvation during the international financial crisis, but consequent drops in consumer demand from Syria's trading partners hit the national economy in 2009 and 2010. Syria withdrew from the General Agreement on Tariffs and Trade (GATT) in 1951 because of Israel's accession. It is not a member of the World Trade Organization (WTO), although it submitted a request to begin the accession process in 2001 and again in 2004. Syria had developed regional free trade agreements, which have been largely suspended as trading partners seek to express disapproval of the Syrian regime's violence against protesters. The Greater Arab Free Trade Agreement (GAFTA) came into effect in January 2005, and customs duties were eliminated between Syria and all other members of GAFTA. Syria's free trade agreement with Turkey came into force in January 2007 but has been compromised by retaliatory steps by both parties, given Turkey's reaction to the Asad regime's violent response to the demonstrations. 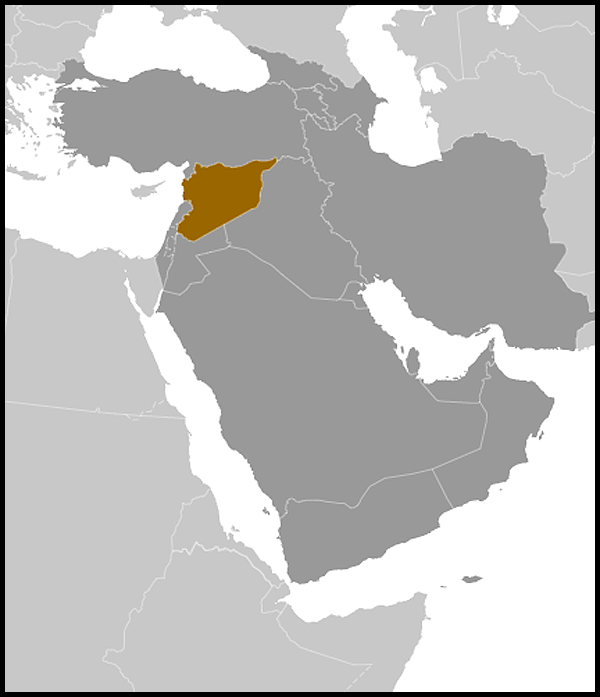 Syria is a signatory to free trade agreements with Jordan, India, Belarus, and Slovakia. In 2004 Syria and the European Union initialed an Association Agreement; the ratification process had not been finalized as of March 2011, and the EU withdrew its offer following the regime's crackdown on opposition and imposition of EU sanctions. Syria claimed a boom in non-oil exports prior to mid-2011, but its trade numbers are notoriously inaccurate and out-of-date. Syria's main exports include crude oil, refined products, rock phosphate, raw cotton, clothing, fruits and vegetables, and spices. The bulk of Syrian imports are raw materials essential for industry, petroleum products, vehicles, agricultural equipment, and heavy machinery. Earnings from oil exports as well as remittances from Syrian workers are the government's most important sources of foreign exchange. The Syrian Minister of Petroleum estimated in January 2012 a loss of $2 billion from sanctions on oil exports. Syria has produced heavy-grade oil from fields located in the northeast since the late 1960s. In the early 1980s, light-grade, low-sulphur oil was discovered near Dayr al-Zur in eastern Syria. Syria's rate of oil production was decreasing steadily, from a peak close to 610,000 barrels per day (bpd) in 1995 down to approximately 379,000 bpd in 2008. In parallel, Syria's oil reserves are being gradually depleted and reached 2.5 billion barrels in January 2009. Recent developments have helped revitalize the energy sector, including new discoveries, enhanced recovery techniques, and the successful development of its hydrocarbon reserves. Syria's oil exports contributed only 7% to GDP, although total domestic and export oil sector activity contributed 25% to GDP. Oil exports for hard currency were, however, over 30% of total export income in 2010 and nearly 35% of Syrian Government income, down from 50% of government income in 2005. Syria became a net importer of petroleum products in 2009, and oil sanctions will temporarily increase the ratio of imports to exports. Syria also produces about 22 million cubic meters of gas per day, with estimated reserves around 240 billion cubic meters or 8.5 trillion cubic feet. While the government had begun to work with international energy companies in the hopes of eventually becoming a significant gas exporter, most gas currently produced is consumed domestically and a number of international oil companies withdrew foreign staff in 2011 and 2012 and restricted their Syria operations in response to the unrest. Demand for electricity is growing at a rate of about 10% per year and is barely met by current generation capacity, and ongoing and planned projects are not expected to be sufficient to meet future demand. Some basic commodities, such as bread, continue to be heavily subsidized, and social services are provided for nominal charges. Subsidies are becoming harder to sustain as demand rises and pressure on government financial reserves increases. Syria has a population of approximately 22.5 million people, and Syrian Government figures place the population growth rate at 2.37%, with 65% of the population under the age of 35 and more than 40% under the age of 15. Approximately 200,000 people enter the labor market every year. Unemployment, already high due to distortions in the economy and drought, has increased dramatically as economic activity has virtually shut down due to unrest, and estimates place it between 30% and 45%. Government and public sector employees constitute about 30% of the total labor force and receive low salaries and wages, often balanced by the opportunity for rampant graft. Government officials acknowledged that the economy was not growing at a pace sufficient to create enough new jobs annually to match population growth even prior to the protests. IMF estimates of negative growth in 2011 will place even more pressure on the labor market. Syrian Government prioritizing of supplies and funds to the security services has increased the percentage of Syrians experiencing poverty and shortages of fuel and food. Syria made progress in easing its foreign debt burden through bilateral rescheduling deals with its key creditors in Europe, most importantly Russia, Germany, and France. Syria also settled its debt with Iran and the World Bank. In December 2004, Syria and Poland reached an agreement by which Syria would pay $27 million out of the total $261.7 million debt. In January 2005, Russia forgave 73% of Syria's $14.5 billion long-outstanding debt and in June 2008, Russia's parliament ratified the agreement. In 2007, Syria and Romania reached an agreement for Syria to pay 35% of the $118.1 million debt. In May 2008, Syria settled all the debt it owed to the Czech Republic and Slovakia. President Bashar al-Asad is commander in chief of the Syrian armed forces, comprising some 400,000 troops upon mobilization. The military is a conscripted force; males serve 18 months in the military upon reaching the age of 18. Although exemptions existed for education or upon payment of $5,000, the government ended all exemptions in late 2011, bringing even more young men under direct security control. Military leadership is heavily dominated by Alawi officers, but the vast majority of troops in uniform are Sunni. Syria's military remains one of the largest in the region, although the breakup of the Soviet Union — long the principal source of training, material, and credit for the Syrian forces — slowed Syria's ability to acquire modern military equipment. Syria received significant financial aid from Gulf Arab states in the 1990s as a result of its participation in the first Gulf War, with a sizable portion of these funds earmarked for military spending. Funds, equipment, and training have gone disproportionately to elite units. Besides sustaining its conventional forces, Syria seeks to develop its weapons of mass destruction (WMD) capability, including chemical munitions and delivery systems. In September 2007 Israeli warplanes attacked a purported nuclear facility in Syria. Investigation by the International Atomic Energy Agency (IAEA) discovered particles of enriched uranium at the site, with a low probability they were introduced by the missiles used to attack the facility. As of March 2011, the IAEA continued to investigate the issue with limited cooperation from the Syrian Government. Ensuring regime survival, maintaining influence among its Arab neighbors, and achieving a comprehensive Arab-Israeli peace settlement, which includes the return of the Golan Heights, are the primary goals of President Asad's foreign policy. Vocal Turkish and Arab League criticism of the Asad regime's repression of protests has drastically limited Syrian influence in the region. Syria reestablished full diplomatic relations with Egypt in 1989. In the 1990-91 Gulf War, Syria joined other Arab states in the U.S.-led multinational coalition against Iraq. In 1998, Syria began a slow rapprochement with Iraq, driven primarily by economic needs. Syria continued to play an active pan-Arab role after emerging from its relative isolation following the Hariri assassination, attempting to assert its influence regionally and expand diplomatic relations with Europe, Latin America, and China. In mid-2011, Syrian relations with Europe worsened following regime violence against the opposition movement, and EU and other development projects were shut down. Some countries in Latin America, especially Venezuela, have maintained good relations but contribute little to Syrian trade or development. Though it voted in favor of UNSCR 1441 in 2002, Syria was against coalition military action in Iraq in 2003. However, the Syrian Government accepted UNSCR 1483 (after being absent for the actual vote), which lifted sanctions on Iraq and established a framework to assist the Iraqi people in determining their political future and rebuilding their economy. Syria also voted for UNSCR 1511, which called for greater international involvement in Iraq and addressed the transfer of sovereignty from the U.S.-led coalition. Since the transfer of sovereignty in Iraq on June 28, 2004, Syria extended qualified support to the Iraqi Government and pledged to cooperate in the areas of border security, repatriation of Iraqi assets, and eventual restoration of formal diplomatic relations. Formal diplomatic relations were established in December 2006, but the bilateral relationship has experienced ups and downs. Iraq has refused to adhere to the Arab League's November 2011 decision to impose sanctions on Syria, possibly to avoid conflict with its eastern neighbor Iran, which continues to strongly support the Asad regime. Up to an estimated 1 million Iraqi refugees lived in Syria after the 2003 U.S.-led intervention in Iraq, of whom more than 224,000 have officially registered with the UN High Commissioner for Refugees, but some thousands have returned to Iraq as the security situation in Syria worsened. The United States remains the largest single contributor to UN and non-governmental organization (NGO) efforts to assist Iraqi refugees in the region. Total U.S. support region-wide in 2011 approached $630 million — up from $400 million in 2008. Since fiscal year 2007 the United States has admitted over 62,000 Iraqi refugees for resettlement. Of that number, over 9,300 arrived in the United States in fiscal year 2011. Most of the Iraqi refugees who have arrived in the United States — over 45,000 — have come from Syria, Jordan, and Turkey, the three countries in the region hosting the most Iraqi refugees. Smaller groups have arrived directly from Iraq, as well as from Lebanon and Egypt. The United States remains committed to assisting Iraqi refugees and plans to continue to help meet the needs of Iraq's displaced population. Additionally, in fiscal year 2012, the United States will continue to admit as many of the most vulnerable Iraqi refugees as possible for resettlement in the United States through the United States Refugee Admissions Program. Syria has played an important role in Lebanon by virtue of its history, size, power, and economy. Lebanon was part of post-Ottoman Syria until 1926. The presence of Syrian troops in Lebanon dated to 1976, when President Hafiz al-Asad intervened in the Lebanese civil war on behalf of Maronite Christians. Following the 1982 Israeli invasion of Lebanon, Syrian and Israeli forces clashed in eastern Lebanon. However, Syrian resistance blocked implementation of the May 17, 1983 Lebanese-Israeli accord on the withdrawal of Israeli forces from Lebanon. According to the U.S. interpretation of the Taif Accord, Syria and Lebanon were to have decided on the redeployment of Syrian forces from Beirut and other coastal areas of Lebanon by September 1992. Israeli occupation of Lebanon until May 2000, the breakdown of peace negotiations between Syria and Israel that same year, and intensifying Arab/Israeli tensions since the start of the second Palestinian uprising in September 2000 delayed full implementation of the Taif Accord. The United Nations declared that Israel's May 2000 withdrawal from southern Lebanon fulfilled the requirements of UN Security Council Resolution 425. Syria and Lebanon, however, claimed that UNSCR 425 had not been fully implemented because Israel did not withdraw from the Sheba Farms area occupied by Israel in 1967, which Syria claimed was part of Lebanon but the United Nations places in Syria. Hizballah has used this occupation to justify attacks against Israeli forces in that region, leading to Hizballah's abduction of two Israeli soldiers on July 12, 2006, which sparked a 34-day conflict in between Israel and Lebanon. After the conflict, UNSCR 1701 authorized the enhancement of the UN Interim Force in Lebanon (UNIFIL), raising its presence in southern Lebanon from 2,000 troops to 15,000. UNIFIL is tasked with ensuring peace and security along the frontier and overseeing the return of effective Lebanese government and military authority throughout the border region. Until its withdrawal in April 2005, Syria maintained approximately 17,000 troops in Lebanon. A September 2004 vote by Lebanon's Chamber of Deputies to amend the constitution to extend Lebanese President Lahoud's term in office by 3 years amplified the question of Lebanese sovereignty and the continuing Syrian presence. The vote was clearly taken under Syrian pressure, exercised in part through Syria's military intelligence service, whose chief in Lebanon had acted as a virtual proconsul for many years. The UN Security Council expressed its concern over the situation by passing Resolution 1559, which called for the withdrawal of all remaining foreign forces from Lebanon, disbanding and disarmament of all Lebanese and non-Lebanese militias in accordance with the Taif Accord, the deployment of the Lebanese Armed Forces throughout the country, and a free and fair electoral process in the presidential election. Former Prime Minister Rafiq Hariri and 19 others were assassinated in Beirut by a car bomb on February 14, 2005. The assassination spurred massive protests in Beirut and international pressure that led to the withdrawal of the remaining Syrian military troops from Lebanon on April 26, 2005. Rafiq Hariri's assassination was one of a number of attacks targeting high-profile Lebanese critics of Syria. The UN International Independent Investigative Commission (UNIIIC) probed Hariri's assassination until the UN Security Council established the Special Tribunal for Lebanon (STL). The STL began operating in March 2009, continuing UNIIIC's work with an aim toward prosecuting the individuals behind the attacks. Syrian-Lebanese relations have improved since 2008 when, in response to French and Saudi engagement with Syria, Damascus recognized Lebanon's sovereignty and the two countries agreed to open full embassies in each country and exchange ambassadors. Syria sent Ali Abdul Karim Ali to Beirut as its ambassador to Lebanon in March 2009, and Lebanon sent Michel Khoury as ambassador to Syria in April 2009. Following his election in November 2009, Prime Minister Saad Hariri, son of the slain leader, traveled to Damascus for discussions with President Asad. During the visit, the two countries agreed to demarcate their border for the first time. As of January 2012, the border had yet to be demarcated. Syrian relations with Lebanese Prime Minister Saad Hariri became strained due to his support for the STL and Syria's continued support of Hizballah. Hizballah and its parliamentary allies engineered the fall of the Hariri government on January 12, 2011 when they resigned from the cabinet en masse, triggering a constitutional crisis. Lebanese Prime Minister Najib Mikati has strong connections to the Syrian regime. Tensions within Syria are increasing strains among various groups in Lebanon. The Syrian regime claims that weapons for the Syrian opposition are crossing the border from Lebanon, and the opposition claims that Hizballah is providing support to the Syrian Government. The United States supports a sovereign, independent Lebanon, free of all foreign forces, and believes that the best interests of both Lebanon and Syria are served by a positive and constructive relationship based upon principles of mutual respect and non-intervention between two neighboring sovereign and independent states. The United States calls for Syrian non-interference in Lebanon, consistent with UNSCR 1559 and 1701. Syria was an active belligerent in the 1967 Arab-Israeli War, during which Israel occupied the Golan Heights and the city of Quneitra. Following the October 1973 Arab-Israeli War, during which Israel occupied additional Syrian territory, Syria accepted UN Security Council Resolution 338, which signaled an implicit acceptance of Resolution 242. Resolution 242, which became the basis for the peace process negotiations begun in Madrid in 1981, calls for a just and lasting Middle East peace to include withdrawal of Israeli armed forces from territories occupied in 1967; termination of the state of belligerency; and acknowledgment of the sovereignty, territorial integrity, and political independence of all regional states and of their right to live in peace within secure and recognized boundaries. As a result of the mediation efforts of U.S. Secretary of State Henry Kissinger, Syria and Israel concluded a disengagement agreement in May 1974, enabling Syria to recover territory lost in the October war and part of the Golan Heights occupied by Israel since 1967, including Quneitra. The two sides have effectively implemented the agreement, which is monitored by UN forces. In December 1981, the Israeli Knesset voted to extend Israeli law to the part of the Golan Heights over which Israel retained control. The UN Security Council subsequently passed a resolution calling on Israel to rescind this measure. Syria participated in the Middle East Peace Conference in Madrid in October 1991, and negotiations that were conducted intermittently through the 1990s came very close to succeeding. However, the parties were unable to come to an agreement over Syria's nonnegotiable demand that Israel withdraw from occupied territory in Golan to the positions it held on June 4, 1967. The peace process collapsed following the outbreak of the second Palestinian Intifada (uprising) in September 2000, though Syria continues to call for a comprehensive settlement based on UN Security Council Resolutions 242 and 338, and the land-for-peace formula adopted at the 1991 Madrid conference. Tensions between Israel and Syria increased as the second Intifada dragged on, primarily as a result of Syria's unwillingness to stop giving sanctuary to Palestinian terrorist groups conducting operations against Israel. In October 2003, following a suicide bombing carried out by a member of Palestinian Islamic Jihad in Haifa that killed 20 Israeli citizens, Israeli Defense Forces attacked a suspected Palestinian terrorist training camp 15 kilometers north of Damascus. This was the first such Israeli attack deep inside Syrian territory since the 1973 war. During the summer of 2006 tensions again heightened due to Israeli fighter jets buzzing President Asad's summer palace in response to Syria's support for the Palestinian group Hamas, Syria's support of Hizballah during the July-August 2006 conflict in Lebanon, and the rearming of Hizballah in violation of UN Resolution 1701. Rumors of negotiations between the Israeli and Syrian Governments were initially discounted by both Israel and Syria, with spokespersons for both countries indicating that any such talks were not officially sanctioned. However, the rumors were confirmed in early 2008 when it was announced that indirect talks facilitated by Turkey were taking place. The talks continued until December 2008 when Syria withdrew in response to Israel's shelling of the Gaza Strip. Turkey's relationship with Israel cooled following the Israeli attack on the Turkish ship Mavi Marmara, part of the "Gaza Flotilla" in 2010, which resulted in the deaths of Turkish civilians including a participant with dual American and Turkish citizenship. Turkey also has criticized the Syrian Government strongly over its violent repression of opposition protesters, and indirect peace talks are not considered possible through this channel. Syria is a member of the Arab Bank for Economic Development in Africa, Arab Fund for Economic and Social Development, Arab Common Market, Arab League, Arab Monetary Fund, Council of Arab Economic Unity, Customs Cooperation Council, Economic and Social Commission for Western Asia, Food and Agricultural Organization, Group of 24, Group of 77, International Atomic Energy Agency, International Bank for Reconstruction and Development, International Civil Aviation Organization, International Chamber of Commerce, International Development Association, Islamic Development Bank, International Fund for Agricultural Development, International Finance Corporation, International Labor Organization, International Monetary Fund, International Maritime Organization, INTERPOL, International Olympic Committee, International Organization for Standardization, International Telecommunication Union, International Federation of Red Cross and Red Crescent Societies, Non-Aligned Movement, Organization of Arab Petroleum Exporting Countries, Organization of Islamic Cooperation, United Nations, UN Conference on Trade and Development, UN Industrial Development Organization, UN Relief and Works Agency for Palestine Refugees in the Near East, Universal Postal Union, World Federation of Trade Unions, World Health Organization, World Meteorological Organization, and World Tourism Organization. However, Syrian membership in some of these organizations, including the Arab League, has been suspended due to Syrian Government violence against its citizens. Relations between the United States and Syria, severed in 1967, were resumed in June 1974, following the achievement of the Syrian-Israeli disengagement agreement. In 1990-91, Syria cooperated with the United States as a member of the multinational coalition of forces in the Gulf War. The United States and Syria also consulted closely on the Taif Accord ending the civil war in Lebanon. In 1991, President Asad made a historic decision to accept President George H.W. Bush's invitation to attend a Middle East peace conference and to engage in subsequent bilateral negotiations with Israel. Syria's efforts to secure the release of Western hostages held in Lebanon and its lifting of restrictions on travel by Syrian Jews helped to further improve relations between Syria and the United States. There were several presidential summits; the last one occurred when President Bill Clinton met the late President Hafiz al-Asad in Geneva in March 2000. In the aftermath of the September 11, 2001 terrorist attacks in the United States, the Syrian Government began limited cooperation with U.S. counterterrorism efforts. Syria has been on the U.S. list of state sponsors of terrorism since the list's inception in 1979. Because of its continuing support and safe haven for terrorist organizations, Syria is subject to legislatively mandated penalties, including export sanctions under the Syrian Accountability Act and ineligibility to receive most forms of U.S. aid or to purchase U.S. military equipment. In 1986, the United States withdrew its ambassador and imposed additional administrative sanctions on Syria in response to evidence of direct Syrian involvement in an attempt to blow up an Israeli airplane. A U.S. ambassador returned to Damascus in 1987, partially in response to positive Syrian actions against terrorism such as expelling the Abu Nidal Organization from Syria and helping free an American hostage earlier that year. Relations cooled as a consequence of U.S. intervention in Iraq in 2003, declined following the imposition of U.S. economic sanctions in May 2004, and worsened further in February 2005 after the assassination of former Lebanese Prime Minister Hariri. Issues of U.S. concern included the Syrian Government's failure to prevent Syria from becoming a major transit point for foreign fighters entering Iraq, its refusal to deport from Syria former Saddam Hussein regime elements supporting the insurgency in Iraq, its ongoing interference in Lebanese affairs, its protection of the leadership of Palestinian rejectionist groups in Damascus, its deplorable human rights record, and its pursuit of weapons of mass destruction. In May 2004, the U.S. Government, pursuant to the provisions of the Syrian Accountability and Lebanese Sovereignty Restoration Act, imposed sanctions on Syria which banned nearly all exports to Syria except food and medicine. In February 2005, in the wake of the Hariri assassination, the United States recalled its ambassador to Washington. On September 12, 2006 the U.S. Embassy was attacked by four armed assailants with guns, grenades, and a car bomb (which failed to detonate). Syrian security forces successfully countered the attack, killing all four attackers. Two other Syrians killed during the attack were a government security guard and a passerby. The Syrian Government publicly stated that terrorists had carried out the attack. The U.S. Government did not receive an official Syrian Government assessment of the motives or organization behind the attack, but security was upgraded at U.S. facilities. Both the Syrian ambassador to the U.S., Imad Mustapha (withdrawn in December 2011), and President Bashar al-Asad, however, blamed U.S. foreign policy in the region for contributing to the incident. After a military action occurred at the Iraq-Syria border in October 2008, in which purportedly there were several Syrian casualties, the Syrian Government ordered the closure of the Damascus Community School, the American Language Center (ALC), and the American Cultural Center (ACC). The school and the language center were allowed to reopen in fall 2010, but both have minimized activities at the beginning of 2012 due to security concerns. After 2009, the United States attempted to engage with Syria to find areas of mutual interest, reduce regional tensions, and promote Middle East peace. These efforts included congressional and executive meetings with senior Syrian officials, including President Asad, and the return of a U.S. Ambassador to Damascus. In March 2011, a group of Syrian students were arrested in the southern city of Dara'a for writing political graffiti on walls, and the government's mishandling of its security response gave rise to ever-increasing demonstrations around the country. The key commercial cities of Aleppo and Damascus remained relatively quiet until December 2011, when larger demonstrations and explosions occurred, challenging the government's claim that the opposition was small groups funded by other countries. The United Nations states that 5,000 have been killed in the uprising's 10-month history, and a monitoring mission from the Arab League could not verify that the Syrian Government was implementing Arab League-mandated plans to end repression. The Arab League's proposal that Bashar al-Asad step down and hand power to Vice President Faruq al-Sharaa heading a joint interim government was immediately rejected by the Syrian regime, and most countries participating in the Arab League monitoring effort consequently withdrew from a planned 1-month extension. Rising bilateral tensions since March 2011 due to the regime's vicious repression have halted efforts to find common ground, and the U.S. Government has repeatedly called for President Bashar al-Asad to step aside and allow a representative government to be formed. Strong sanctions, implemented in coordination with countries in Europe, Asia, and the Arab world, have put pressure on the regime's ability to continue its crackdown on opponents. In late January 2012, the Arab League called on the United Nations Security Council to condemn Syria's actions and to demand a rapid transition to an interim government. Following an attack on the U.S. Embassy and Ambassador's residence on July 11, 2011, the embassy reduced non-U.S. citizen services and instituted more stringent security procedures. As incitement and harassment of embassy personnel increased, U.S. officers were gradually evacuated. A skeleton staff, including Ambassador Robert Ford, remains at post.